On this bike ride I rode back to the Tidal Basin (MAP) in West Potomac Park to enjoy the remaining cherry blossoms that haven’t yet been ruined, but soon will be by the rain storms that are being predicted to arrive soon. And as I was walking around the Tidal Basin and passing by The Franklin Delano Roosevelt Memorial on the southwest bank of the water, I saw a rough-hewn stone structure about the size of a man located just a few feet off the sidewalk that surrounds the water’s edge. When I went over to get a closer look and find out more about it I learned that it is a pagoda. A pagoda is a tiered tower with multiple eaves, built in traditions originating as stupa in historic South Asia and further developed in East Asia or with respect to those traditions, common to Nepal, India, China, Japan, Korea, Vietnam, and other parts of Asia. 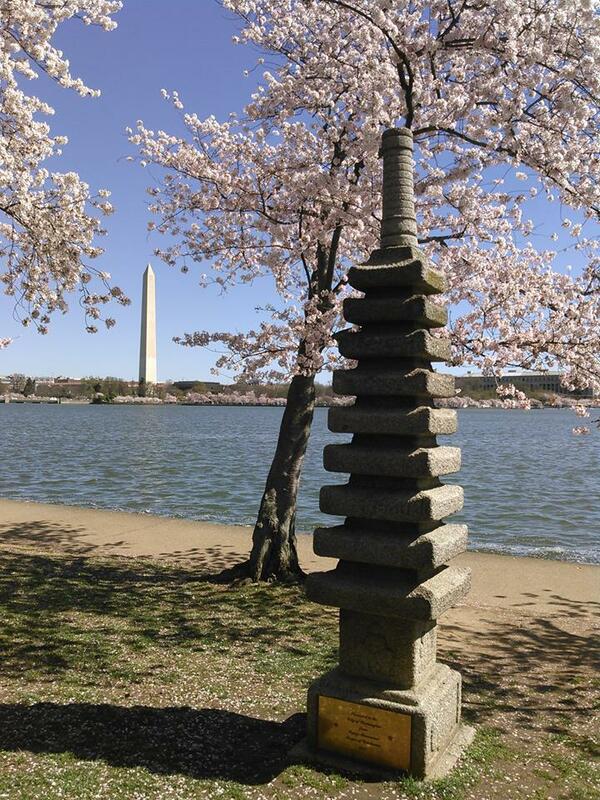 The pagoda at the Tidal Basin is a Japanese one, which is directly derived of the Chinese pagoda, itself an interpretation of the Indian stupa. Japanese pogodas can be built in many forms. Some are built out of wood, and are frequently buildings. But the vast majority of pagodas carved out of stone, like the one at the Tidal Basin. Stone pagodas are nearly always small, and as a rule offer no usable space. If they have more than one storey, pagodas are called tas.